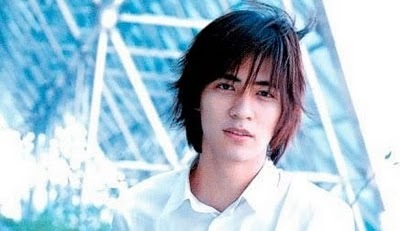 Vic Zhou, 34, has been a sensation throughout Asia since 2001 because of his first drama, Meteor Garden, which was insanely popular. He, along with the 3 other male leads in that drama, formed F4 and they were the dream of so many teenage girls back then. Even though F4 is now disbanded, they still remain popular and loved by the public. Reen Yu, 28, first rose to fame in 2009 with her supporting role in Black and White. It was also through this drama that she met Zai Zai, who was the main character. Her most recent drama was Lady Maid Maid in 2012. 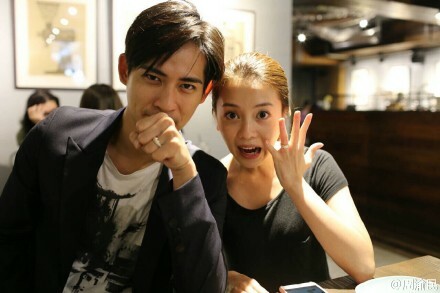 It is said that Zai Zai had proposed to Reen Yu out of the blue while eating at home one day a while ago. They had chose to register the marriage on 10/11 because they both happened to be free. And with that, Zai Zai is the 2nd member of F4 to tie the knot even though he is the youngest. Can you recognise Barbie Hsu, Jerry Yan and Vic Chou? I’m not out of my hiatus yet (soon, though!) and I thought Marian would be posting about this but when I realised she didn’t, I thought “I can’t let this news slip by!” and hence, here I am. I had known that Zai Zai got married on 10 Nov because I saw some news headlines but it’s only today that I realised that his wife is actually Reen Yu who was the main female lead in Love Buffet which starred Aaron Yan and Calvin Chen. Male god Zai Zai is married and his wife is the rumoured girlfriend of the other male god, Aaron Yan? Alright, this lady must have saved the Milky Way in her previous life. Looking at the number of heartbroken tweets on Weibo, I must agree with this, Reen Yu is one lucky girl with a lot of good karma. Congratulations Zai Zai and Reen Yu! Make sure you stay loving and blissful so you don’t waste all the sacrifice we, rabid fangirls, have made for you two! what made this news shocking was that I wasn’t able to write about it (haha!) so thank you for doing it, partner! I’m actually heartbroken about it that’s why I couldn’t write about it lol just kidding! Beyond happy for my first love and genuine happiness could be definitely seen from his face through these photos 😀 Hoping that they get to have a wedding banquet soon! Wow! Jerry and Ken was left behind hehehehe. Ken have a girlfriend but handsome jerry was loveless! Hope it’s maggie jiang for him, because they are perfect match for me. If i have all the power i will make them love each other hehehehe.